The small, independent and incredibly effective Prison Policy Initiative (PPI) has delivered us a great service once more. Not content with *only* filing lawsuits, pressing states to move away from Prison Based Election Gerrymandering; battling corrupt and expensive jail phone systems; and protecting prisoners’ rights to communicate unhindered by letter, PPI is committed to providing fellow prison reformers with accurate up-to-date data on mass incarceration. We cannot rely on the governmet to provide recent data. “Until 2006, researchers, advocates, and policymakers could rely on state-level race and ethnicity incarceration rate data from the Bureau of Justice Statistics “Prisons and Jails at Midyear” series. Unfortunately, these state-level statistics have not been updated in eight years,” says PPI. 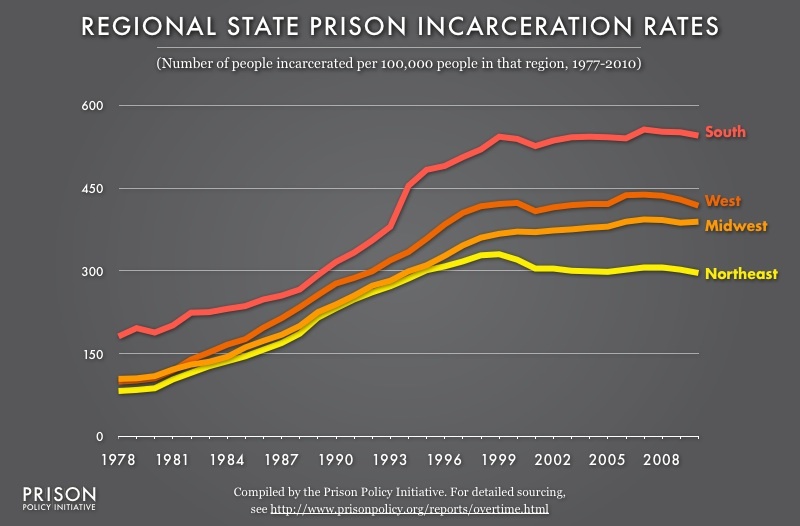 PPI has used data from the more recent 2010 U.S. Census counts to measure each state’s incarceration rates by race and ethnicity. Most (57%) people incarcerated in the United States have been convicted of violating state law and are imprisoned in a state prison. Monitoring trends at the state-level is imperative. In total, PPI has published 316 new charts, graphs and maps for an accurate view of our shameful, expensive and failed recent history of imprisonment. Kudos to Peter Wagner, Leah Sakala and all the PPI staff. kudos to PPI for their thorough research and commitment to prison reform!